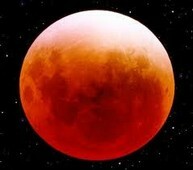 Last night and/or this morning for some, was an amazing lunar eclipse. I was stunned by it myself. Have you ever looked at the moon straight up in the sky? That’s where it was and it was breathtaking. This being the only time I’ll ever see it since the next one won’t happen for 400 years, I am thankful that the clouds cleared so I could witness something so surreal. If you didn’t get a chance to see it, here’s the CNN video that captures it quick style. Let me just say that it DOES NOT do it justice.